Pass-box limit the transfer of contaminants and significant changes in the cleanroom environment by reducing the number of people that walk in and out of the cleanroom.The appropriate custom cleanroom air lock for your application should be chosen based on size, style, materials and whether the pass-box is mounted or floor-based on size, style, material, and whether the pass-box is wall-mounted or floor mounted. Additional features may also be important based on industry requirements and certifications. Clean Air Procucts provides custom pass-box cabinets, pass -thru chambers, and pass-through windows that are designed and manufactured to meet our customers's cleanroom specifications. We also offer a full line of standard pass-throughs in sizes and configurations to meet a wide variety of cleanroom requirements. The cldeanroom pass-box models below are just a sample of what we can provide. Request a quote on a custom entry system for your cleanroom, or contact us to discuss your unique requirements. 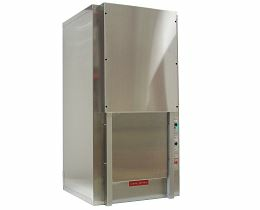 Fire -Rated Custom Pass-box Cleanrooms that are required to meet state and local fire codes. This wall-mounted pass-box are designed for cleanrooms that are required to meet state and loal fire codes. this chamber is buit with an innovative double-wall design, sturdy stainless steel materials and solid construction. They feature a fire-rated door with a wire safety glass window and a fire rated mechanical interlock to provide 90-minute fire-rated protection. These wall-mounted pass-box chambers enable transfer of parts and equipemnt into/out of a cleanrooms in confined spaces where a standard swing door is not suitable. The sliding door also causes less air turbulence within the cleanroom. Numerous mounting options provide versatility. Like their manual conterparts above, these wall-mounted pass-through chambers are ideal for cleanroom applications where a swingling door is impractical, and adds automatic sliding door access for fast and efficient operation. The doors are counter weighted and manually operated, and feature anodized aluminum door pulls with a push rod interlock.